OHMYGOSSIP – According to the American edition Famousbirthdays.com the fifth grader of Tallinn Jewish School, 11-year-old Estella Elisheva is an exceptionally gifted girl and for the past few years the American newspapers have titled her the next Taylor Swift in world music. Estella Elisheva, while charming hundreds thousands listeners with violin music already at the age of seven, remains modest and emphasizes that she does not wish to be anybody’s successor. „Being famous, well-known and admired is definitley intriguing – however, great popularity does not actually appeal to me, I’d rather claim to fear that,” says the young and prominent violinist Estella Elisheva to NordenBladet. 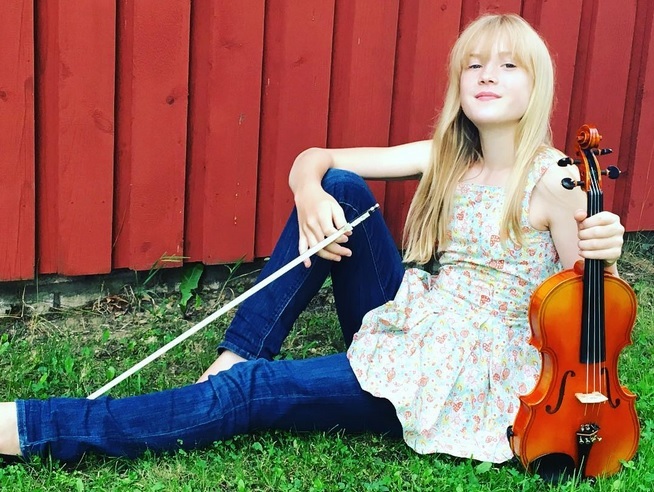 Estella Elisheva has by Swedish, Finnish, British and American media channels alike been titled today’s most gifted junior violinist and composer. In international media she has many a time been compared to the world-renowned pop-violinists Lindsey Stirling and Taylor Davis. „They both are very likeable, however, I myself make different kind of music. I find classical music very sympathetic and see as my prime examples Andrew Lloyd Webber, Claude Debussy, Giuseppe Verdi, Wolfgang Amadeus Mozart, Johann Sebastian Bach, Frédéric Chopin. It is as though I live in a bygone century, in the past, it is as though I were not from our times at all,” says the youthful violinist Estella Elisheva to NordenBladet. „My violin supervisor Kaari Klesment, my music teacher Inna Kandel and my mom Helena-Reet Ennet have been the most significant people to influence and shape me. They are infinitely special to me, I would even say they are unusual and unprecedented – they are people who can cater energy, strength, power, hope, mystery. They know so much about the universe of music. If it were anything whatsoever that I were treasured for, this is entirely due to my people,” says young Estella Elisheva. Presumably she is the youngest violinist in the world to catch such attention. She has accomplished to assemble more than half a million active fans globally and her concerts are requested by various theatres world wide. Estella Elisheva Instagram posts are available HERE, Twitter posts HERE and Facebook posts HERE. Hereinafter photos of the 11year old Estella Elisheva have been annexed.